Varaždin is situated in the northern part of Croatia, 81 km north of the Croatian capital Zagreb. It has population of 40000. This central European town is ancient Croatian capital. During the reign of Maria Theresa northern Croatia was part of Habsburg Monarchy, and the seat of the Croatian Royal Council (government) was in Varaždin from 1767 till the great fire in 1776. The old town fortification, the central part of the town, numerous museums, galleries and collections as well as the Varaždin cemetery, protected as a horticultural monument, represent the main tourist attractions of Varaždin. For more than eight centuries Varaždin has been the center of socio-political, economic, and cultural development of northern Croatia. A number of its citizens honorably carried its name around the world, working in the fields of literature, history, science, music, medicine, economics, sports and various other activities. Varaždin has preserved a priceless historical heritage and historical documentation of its architecture, economic development, education, culture, art and health care for past and future generations. The architecture of buildings was preserved from the earliest times, and contemporaries rightfully call Varaždin a baroque city. The school system and cultural and artistic life have long since been developed. A hospital and other forms of health care were organized in the early times, and Varaždin was also the cradle of firefighting in the wider area. Varaždin is an ancient city that was first mentioned in 1181 in a verdict in which the Croatian-Hungarian king Bela III returns possession of the town Varaždinske Toplice to the archbishop of Zagreb. This 830-year-old document mentions Varaždin (Guarestin) and local residents (Guaresdienses). In 1209 Andrija II Arpadović (Andrew Arpad II) issued a charter which gives Varaždin the rights of a free royal city. In 1406 King Sigismund confirms that residents have the right to hold an annual fair, which lasted a week and took place in the suburbs north of the old city. In a document from 1464 Matija Korvin (Matthias Corvinus) allowed the crest of Varaždin, accentuating that it had already been in use for a long time. Trading had been very important for the development of Varaždin in the Middle Ages, and the river Drava was an important route. 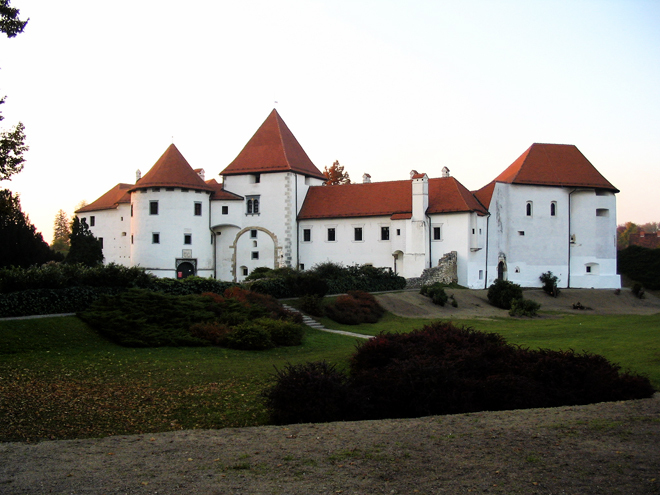 During past centuries Varaždin has often been the scene of important political events. Parliament was held first at City Hall, and from mid-century at the Drašković palace. It was permanent residence of Nadaždi, who became president of the Regents Council in 1767, and the Council of Bans moved there also. With that Varaždin virtually became the Croatian capital. The rich and luxurious city life was suddenly stopped by a big fire in 1776, in which two thirds of the city were burned down. That represented the end of the political and administrative development of the city. Varaždin is surrounded by and filled with green surfaces. The largest and most beautiful green area in the city of Varaždin is the city cemetery (whose beauty is second only to that of the Viennese Schoenbrunn). The Vatroslav Jagić Park (next to the Croatian National Theater), many arbored walks and floral hanging gardens should also be mentioned. Near the city center is the only specialized entomological museum in Croatia, where you can see the rich world of insects. The founder of this department is Franjo pl. Košćec, and it is located in the Herczer Palace within the City Museum. 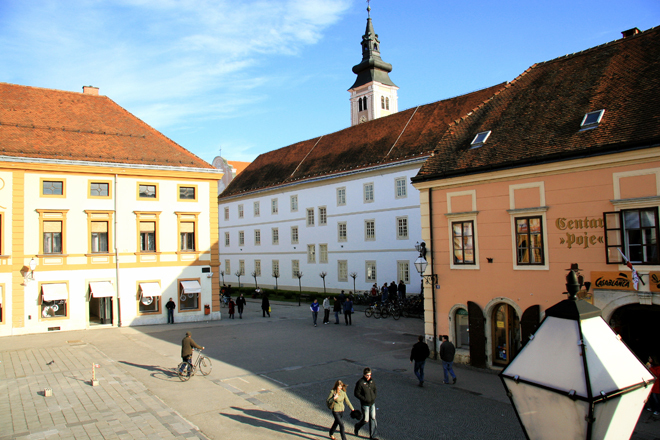 There are many historic buildings in the city, and the most representative is the Old town, once a fortress, which was transferred to state ownership in 1925 and now houses art collections of the Cultural Department of the City Museum of Varaždin. It is surrounded by embankments that are ideal for a nice relaxing walk. Many churches also require special mention. Former Jesuit and later Pauline church was converted into a cathedral of the Diocese of Varaždin. Since the beginning of the 18th century there has been a Capuchin church, and in its proximity is the church of St. Vida, which had been the only church outside the walls of the former city, in order to be closer to the common people. The Ursuline order came around 1703 and built a church, a convent and a school. There are also a baroque Franciscan church or church of St. John the Baptist, with its famous old organ, and the parish church of St. Nicholas, alongside a few small votive chapels. It is particularly pleasant to take a stroll down the old part of town, old streets and squares. To mention just a few of them: Gundulićeva or Dućanska Street (named after the writer Ivan Gundulić), Gajeva (writer Ljudevit Gaj), Kukuljevićeva or Dravska Street (politician, historian and writer Ivan Kukuljević) Bakačeva (ban Bakač Erdödy), Draškovićeva (count Janko Drašković), Kranjčevićeva (poet Silvije Strahimir Kranjčević) Padovčeva (Varaždin guitarist Ivan Padovec) Stančić square (painter of unmatched panoramic views of Varaždin Miljenko Stančić), Ban Josip Jelačić Square, Franciscan Square (named after the Catholic order that was founded by St. Francis of Assisi in the 12th century), Liberty Square (formerly the Parish Square, named after the parish church of St. Nicholas), King Tomislav Square (Croatian king from the 10th century). The first mention of schools in northwestern Croatia dates back to the 12th century. The majority of urban population was made up of craftsmen, clerks and merchants who, most surely, had to master at least the basics of general education. That is why the first secular schools were established in Varaždin in the 15th century. The Varaždin gymnasium (high school) was founded in 1636, and the first teacher of this school was the famous Kajkavian writer Juraj Habdelić. Later, the Jesuit order obtained a very notable place in education, and was wholeheartedly supported by the Varaždin nobility. Today there are two gymnasiums in Varaždin, and the first of them was recently substantially expanded and modernized to improve teaching conditions. Many famous and deserving Croats were high school students in Varaždin. Music has always been tightly woven into the life of local people, ever since the 13th century. Varaždin Baroque Evenings, a very famous festival of baroque music, have been held at the end of each September since 1970. In addition there are occasional international music festivals and musical meetings for children and youth. The town has an excellent music school where young talents from the region come pouring in. A Jesuit theater operated in Varaždin until the 18th century, and later the German touring troupes would perform plays. The present building of the Croatian National Theater was opened in 1873. That was 22 years before the one in Zagreb, the Croatian capital! Old Varaždin also has a rich artistic heritage; numerous works have been made in the city itself or in the surrounding area. Artistic life during the centuries and its course in the late 19th century created the conditions for the development of contemporary art in Varaždin. The City Museum was founded in the mid-thirties of the 20th century, and it holds the collected works of art of many artists. For fifteen years, beginning at the end of August and lasting for ten days, a festival called Špancirfest occurs - a ceremony that happens on the fly, during a walk, with the local word for walking being "špancirati". It is a happy combination of artistic expression, Croatian traditional and modern handicrafts and a delicious culinary tradition. The entire city is one unique stage and the visitors are counted in hundreds of thousands. 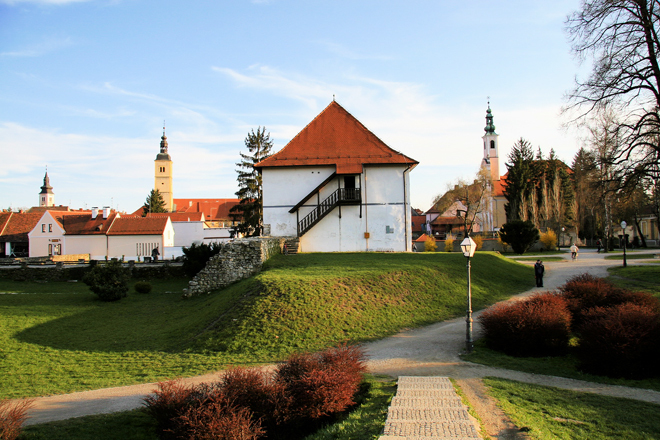 Varaždin is surrounded by numerous famous historic small towns. For example, there is Varaždinske Toplice, which blossomed in the Roman period between the 1st and 4th century. Today it is famous for its thermal spas and Roman excavations. The modern Hotel Minerva provides great opportunities for sports and recreation. Trakošćan is the pearl of the Zagorje region and one of the most beautiful castles in Croatia, located on a high conical hill in a beautiful region, surrounded by forests, meadows and slopes of surrounding mountains. Castle Maruševec is distinguished by its beauty and appeal as one of the most beautiful jewels of Zagorje, alongside castles Trakošćan and Veliki Tabor. The Opeka arboretum, with a baroque castle and gardens, ranks first among the arboretums in Croatia for its richness and importance. The cradle of science, art and culture created by the Paulines in Croatia is the city Lepoglava, located within the picturesque landscape of Zagorje in the valley of the river Bednja. The most important women's handicraft in Lepoglava is the lace which is ranked among the top in Europe.